hi - can you help me please? Are the cabinets & doors bespoke £££ or can I buy ready made as photo? 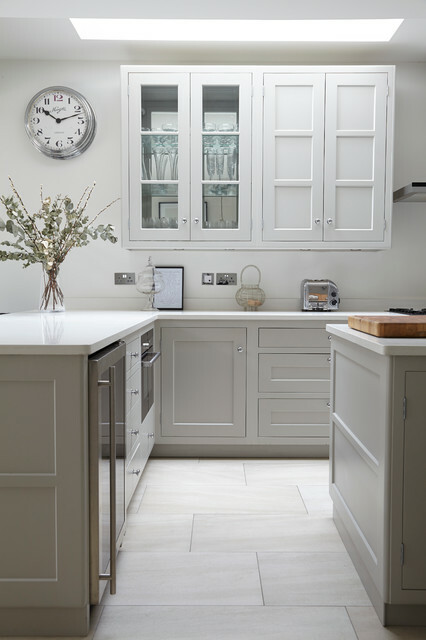 Love the kitchen - can you tell the cabinet colour please? Flooring - What are the floor tiles please? Where are the tiles from please? Colour - What colour are the units please? Amanda Pollard added this to Have I Got Room for a Wine Fridge? Replace a cupboardFor wine connoisseurs who like to keep their wine at varying temperatures, there’s the option of a dual- or even triple-zone wine fridge. These allow you to store bottles in different areas of the cooler, so they’re kept at their optimum temperature. Multi-temperature fridges come in fairly slim designs, but you might need a little more space if your collection is large. Rather than tucking your wine cooler between units, dedicate a cupboard space to it, as the designers have done here. You’ll lose some storage, but it could be worth it if you love good wine. Stylish Scandy Style garden apartment in Chelsea.